Freshman guard DaJuan Ridgeway passes the ball to his teammate Kuol Arop to bring the play to life on the offensive baseline. Ridgeway darts away from an opposing Richland player as the play builds up, with Sean Odum feeding Ridgeway the ball on the right side. His moves into space as he hits a 3-pointer to start off the game. That athletic DNA is also in his half-brother, Demetrius Harris, 26, a tight end for the Kansas City Chiefs. Harris played college basketball at Mineral Area College in Missouri and later club football at the University of Wisconsin in Milwaukee. He was signed by the Chiefs as an undrafted player in 2013 for the practice squad and was in the senior squad by the next year. Harris often tweets about Ridgeway’s progress at Eastfield, sharing videos and tweets by Fletcher after having put in a solid game. 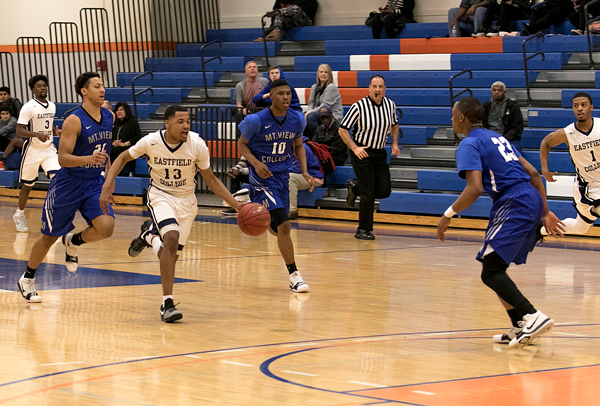 He’s even had the chance to see a game in person, having visited for Eastfield’s away loss to Richland Feb. 3. Ridgeway has helped the Harvester basketball team go 6-2 in conference. The team is in prime position to win the regular season title. With 12.5 points per game, 38.6 percent on 3-pointers, and a 42.5 percent from field goals, he’s been a solid contributor to the team this season. Ridgeway was a three-year varsity starter from Jacksonville High School basketball team in Arkansas when he was recruited by Richardson at a basketball showcase at Texas A&M in Commerce. Fletcher said he and Richardson know what players are the best fit for the program, and called Ridgeway a talented and dynamic athlete. Ridgeway said he credits his work ethic to Harris and his mother who raised five kids. The youngest of five siblings, 18-year-old Ridgeway is following a similar path Harris took by attending a junior college. He said he’s learned a lot from his older brother about the challenges of aiming to be a professional athlete. Growing up with Harris, Ridgeway said the two were always close. Ridgeway was a part of Harris’ Amateur Athletic Union team and traveled to various locations to compete. Harris said the episodes would worry his family, but they don’t occur anymore. Harris also helped Ridgeway’s passion for sports. “Ju,” as he is often called, has been playing basketball and baseball since he was about 4 years old. He also played football in his preteen and early teens years. Over the summer, Ridgeway accompanied Harris for his NFL offseason workouts. Ridgeway said having a brother like Harris has help him grow, and he’s motivated and compelled to exceed on the court.